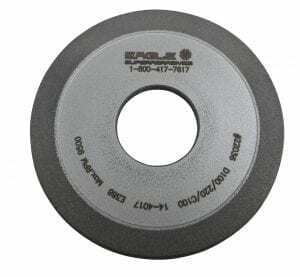 CBN Borazon Wheel Thermal Stability | Eagle Superabrasives Inc.
Eagle Superabrasives is a premier supplier of superabrasive supplies in the United States. With an extensive inventory of over 6,000 Diamond, CDX and CBN Borazon Wheel in stock, we are able to ship ninety percent of orders same-day! Custom orders can be filled in as little as seven days. Borazon is a brand name of a cubic form of borazon nitride (cBN). Borazon gives CBN Wheels a color tint that can range from black to brown and even gold depending on the bond that was used on the wheel to adhere the superabrasive to the core. CBN is a man made material that rivals the hardness of diamond and even has the same crystal structure as diamond. The biggest difference between Diamond and CBN is seen atomically in the crystal structure itself. Diamond crystal structure, bonds between carbon atoms whereas CBN replaces the carbon atoms with borazon atoms. The reason that CBN is such a superior superabrasive is due to this difference in the atoms of the crystal. Diamond is not able to machine ferrous materials, because the carbon atoms chemically react with the carbon in the material being worked on. Contrarily, CBN Borazon Wheels are able to grind away ferrous materials with ease because the borazon atoms do not chemically react with the ferrous materials. Although Diamond may be the hardest material, it doesn’t always remain hard under high temperatures. At around 700 degrees, Diamond begins to break down and lose its hardness. CBN, however, keeps its hardness, even when machining temperatures exceed 1,000 degrees! With the high thermal stability of a CBN borazon wheel, high speed grinding is an ease. There is no fear of a burnt surface or worse, the breakdown of the wheel itself. How often should I replace my CBN Borazon Wheel? CBN Borazon wheels are such a superior product, that the only limiting factor of the life of the wheel is the bond that holds the superabrasive to the core. The breakdown of the wheel occurs when the bond, begins to erode and loses its grip on the cBN partical. Our superabrasive wheel lineup, contain bonds that are formulated in house by our chemist and engineers. We pride ourselves in the superior strength of our bonds, so our team of chemist and engineers are constantly developing and testing new bonds to ensure the integrity of our wheels.If you would like to read more about CBN Borazon Wheels click here. When you’re ready to try the best, trust the experts at Eagle Superabrasives. Our friendly and knowledgeable staff will provide you with unparalleled customer service, offering advice and support along the way. Contact us today!